Dr. Robin Rutherford discusses how the Dental Facelift procedure can rejuvenate a patient’s face and teeth for a more youthful-looking appearance. Odessa, TX – At the Art of Dentistry, Odessa cosmetic dentist Robin Rutherford, DDS offers an innovative treatment designed to help patients restore a more youthful, vibrant facial aesthetic. Known as a Dental Facelift, Dr. Rutherford says this noninvasive procedure is an alternative to more comprehensive cosmetic treatments and can help restore the appearance of aging skin and worn teeth. 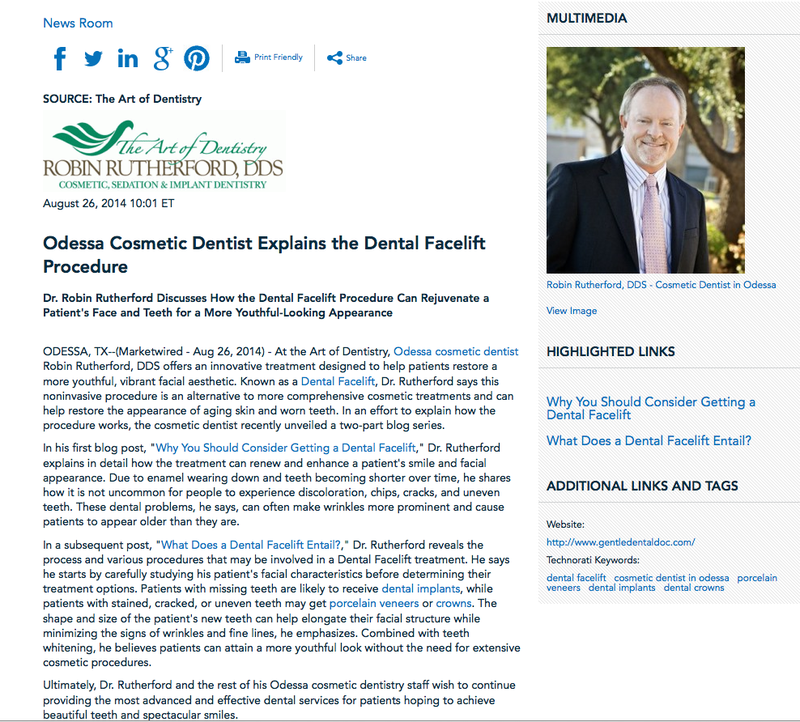 In an effort to explain how the procedure works, the cosmetic dentist recently unveiled a two-part blog series. In his first blog post, “Why You Should Consider Getting a Dental Facelift,” Dr. Rutherford explains in detail how the treatment can renew and enhance a patient’s smile and facial appearance. Due to enamel wearing down and teeth becoming shorter over time, he shares how it is not uncommon for people to experience discoloration, chips, cracks, and uneven teeth. These dental problems, he says, can often make wrinkles more prominent and cause patients to appear older than they are. In a subsequent post, “What Does a Dental Facelift Entail?,” Dr. Rutherford reveals the process and various procedures that may be involved in a Dental Facelift treatment. He says he starts by carefully studying his patient’s facial characteristics before determining their treatment options. Patients with missing teeth are likely to receive dental implants, while patients with stained, cracked, or uneven teeth may get porcelain veneers or crowns. The shape and size of the patient’s new teeth can help elongate their facial structure while minimizing the signs of wrinkles and fine lines, he emphasizes. Combined with teeth whitening, he believes patients can attain a more youthful look without the need for extensive cosmetic procedures. Ultimately, Dr. Rutherford and the rest of his Odessa cosmetic dentistry staff wish to continue providing the most advanced and effective dental services for patients hoping to achieve beautiful teeth and spectacular smiles. Voted the “Best Dentist in Odessa” by the Odessa American Readers’ Choice poll, Dr. Rutherford graduated from Texas A&M University and earned his dental degree from the University of Texas Dental School at San Antonio. Texas Monthly Magazine has named him one of the “Texas Super Dentists” from 2011 until 2014, and he has received over 600 hours of continuing dental education in the past three years. He is also a member of the American Academy of Cosmetic Dentistry, a member of the American Orthodontic Society, and a Diplomate of the American Dental Implant Association. Dr. Rutherford is available for interview upon request. For more information about Dr. Robin Rutherford and The Art of Dentistry, please visit gentledentaldoc.com or facebook.com/gentledentaldoc.